The kids are headed back to school tomorrow and so we spent the afternoon on the beach soaking up the last of the summer sun. We brought a picnic dinner, pitched a tent in the sand, and enjoyed swimming in the warm lake. Potato salad is the quintessential summer picnic food, and this is a more refined take on an old classic. 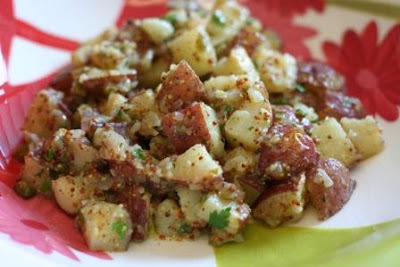 The recipe is based on a potato salad my brother made for us when we visited a few weeks ago for our nephew's birthday. 1. Toss baby potatoes, shallots, and garlic in some olive oil and wrap in foil. Roast on BBQ over medium heat, turning regularly, for 30 mins, or until soft. Remove from foil. 2. Dice potatoes, chop shallots, and mince garlic. Toss with remaining ingredients and season to taste.